Soldiers' Angels - Our Waitlist of Adoptees is Full! Have you heard of the Soldiers’ Angels Deployed Adoptions Team? 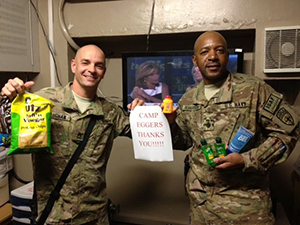 It is a team of dedicated Angels who support service members deployed overseas in support of combat or humanitarian missions. The goal of this team is to ensure that no service member feels alone throughout their deployment. Currently, our list of service members awaiting adoption is greater than the number of Angels we have to support them! We are in need of more dedicated Angels to help support these brave men and women. Interested? Take a moment to get to know some of the service members awaiting adoption here.